Nebraska is a largely rural state in the Midwest region of the United States. Cattle and cornfields are common sights during a drive through Nebraska, but the cities of Omaha and Lincoln add some metropolitan life to the sparsely-punctuated landscape. With so much wide-open space, it’s no surprise that Nebraska has many outdoor activities for visitors. Nebraska has eight state parks, historical trails that trace the routes of cowboys, pioneers and the Pony Express, and many opportunities to hunt, fish, camp, hike, bike and go boating. Nebraska is located in “tornado alley”, and thunderstorms and tornadoes often occur in summer, spring and sometimes autumn. Visitors should be aware of the Health & Safety links in our Nebraska cultural guide below in case of extreme weather. To find out more about arts and culture, sports, food and the history of Nebraska, see our state cultural guide below or see www.visitnebraska.com. Pioneer Village in Minden. Photo by Rolf Blauert. Harold Warp Pioneer Village contains over 50,000 historical objects and 28 buildings depicting pioneer history from the 19th century to today, including automobiles, planes, farm equipment, a log cabin and a merry-go-round. The museum is located in Minden in south-central Nebraska. The Homestead National Monument of America in Beatrice, NE looks at the history of the United States in the mid to late 19th century when the Homestead Act granted land to many Americans. Historical exhibits, tours, nature trails, special events and activities allow visitors to see what life was like as a pioneer on the prairie. The Nebraska History Museum in Lincoln, NE has many exhibits and artifacts related to the history of the Cornhusker State dating back to over 10,000 years ago. 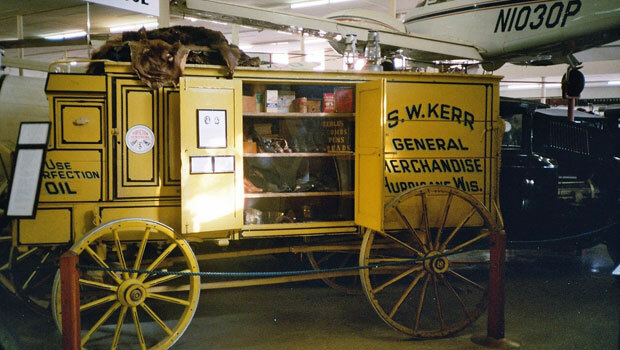 Exhibits on American Indians, the Pony Express, World War II and the early days of Nebraska’s statehood are examples of the information available at the Nebraska History Museum. Willa Cather was an American author who grew up in Nebraska and often wrote about life on the Great Plains. Visitors can see her home, her hometown, the Red Cloud Opera House and other historic buildings related to Cather during a visit to Red Cloud and the Willa Cather Foundation; visit the website for more details. Carhenge is a replication of the famous Stonehenge site using vintage cars in place of stone slabs. Visitors can also see other sculptures at the nearby “Car Art Reserve." Camping is not permitted on site, but visitors can stay at the nearby town of Alliance. The Durham Museum in Omaha displays artifacts and exhibits that range from restored train cars to 1940s storefronts to popular female rock musicians. Public lectures, tours and special events are also held at the museum. The Strategic Air & Space Museum in Ashland presents exhibits on space, science, engineering and history, including a large collection of aircraft from the U.S. Air Force. Tours, planetarium shows and special events are available throughout the year. 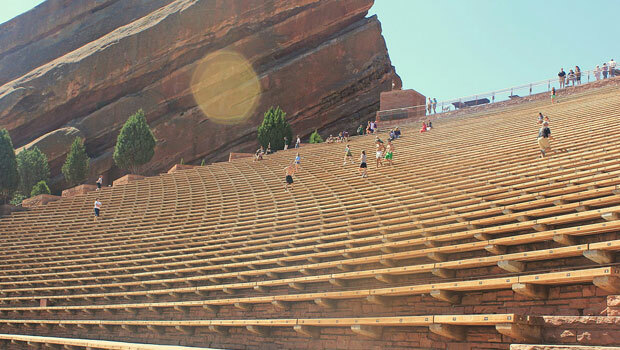 Red Rocks Amphitheatre. Photo by Mitul0520 . Nebraska has no major league professional sports teams, but international visitors can watch live American sports games from minor league sports teams and at local colleges. The Nebraska Cornhuskers, also known as the Huskers, are particularly well known for their successful college football team. The team holds a record for the most sold-out games in a row; in November 2012, the team had it’s 325th consecutive sold-out game. Ashfall Fossil Beds State Historical Park in northeast Nebraska displays well-preserved fossils from 17 species of animals that died after a volcanic eruption 12 million years ago. Visitors can see the fossils, including new fossils that have recently been discovered, walk on nature trails, and learn about the history and geology of the area. Chimney Rock is a rock formation near Bayard in western Nebraska and a former landmark for pioneers on the California, Oregon and Mormon Trails. Today, visitors can take tours of the area and view museum exhibits and video presentations about the area’s history at the visitor’s center. Fort Niobrara National Wildlife Refuge in north-central Nebraska protects a wide range of flora and fauna, including bison, elk and prairie dogs. A self-guided driving tour is available to view animals and historic sites on the refuge, and visitors can also take a nature walk or explore the Fort Niobrara Wilderness Area on foot or by raft. Scotts Bluff National Monument was a landmark for Native Americans and pioneers on the Oregon, California and Mormon Trails. Outdoor activities available at the monument include hiking trails, ranger-led tours, living history demonstrations and a shuttle trip to the summit of Scotts Bluff. The Stuhr Museum is an outdoor living history museum that allows visitors to experience the pioneer history of Nebraska through interactive exhibits, activities, demonstrations and guided tours. Sites at the museum include a log cabin settlement, Pawnee Indian site, a railroad exhibit and a farm machinery building. Many Nebraskans can claim German, Danish, Czech or Italian heritage, so visitors may find ethnic dishes from these countries during their travels in Nebraska. And as a largely rural state covered in flat, prairie land with many cattle ranches and farms, beef is a popular menu item in the state. You can also find local foods made in Nebraska at the Fresh from Nebraska website. Browse a map of local farmers’ markets in Nebraska to find fresh fruit and vegetables and homemade products from local vendors in your community. In March, the Omaha Film Festival shows feature films, short films, documentaries, animated films, experimental films and a special section of Nebraskan-made movies from independent filmmakers in the United States and around the world. Over 90 films are screened at the weeklong festival in Omaha, and visitors can also attend workshops and other events. Kool-Aid Days celebrates the drink that was invented in Nebraska, Kool-Aid! The festival includes games, contents, food, activities at the Hastings Museum and lots of Kool-Aid. Nebraskaland Days in June is the state’s biggest rodeo and acts as a celebration of Nebraskan culture and heritage. The event also includes an art show, parades, live music, food, family activities, a heritage festival and much more. Nebraskaland Days is held in North Platte, NE. The Winnebago Pow-wow is a cultural event hosted by the Winnebago Tribe of Nebraska. The June festival lasts for four days and includes traditional dancing, music, food, performances and other events. Maha Music Festival celebrates Omaha’s arts and music scene and features national and local indie rock bands performing on multiple stages. Ticketholders can bring chairs or blankets to the one-day August event. The Nebraska State Fair in late August/early September is held in the state capital of Lincoln and has been a local festival for over 140 years. The event includes agricultural shows, parades, marching bands, live concerts, a petting zoo, races, cooking contests, carnival rides and much more. In August the Wilber Czech Festival celebrates the Czech heritage of Nebraska with three days of traditional music, food, costumes, activities and parades in the town of Wilber, which is also known as the Czech Capital of Nebraska. There are a limited number of public transportation options in Nebraska, and most visitors may wish to travel by car, if possible. Greyhound and Megabus operate bus services in Nebraska and to surrounding areas. Greyhound service connects to a nationwide system of buses that travel across the United States. Amtrak’s California Zephyr route travels from Chicago to California and makes stops in Omaha, Lincoln, Hastings, Holdrege and McCook. Habitat for Humanity builds low-cost housing for families in need and runs shops called ReStore to raise money for their work. Volunteers can help build homes in many locations in Nebraska – no experience required! Find a local affiliate and see how you can help as an individual or part of a group. Food Bank for Lincoln and Food Bank for the Heartland are two examples of organizations in need of volunteers. Individuals or groups can volunteer to help with tasks like sorting donations, packing boxes, unloading food trucks and many other activities. Short and long-term projects with Nebraska State Parks are available to individuals and groups, like cleaning up a park, planting trees or helping out at an information desk. Visit the website above to learn more about the many volunteer opportunities available. Volunteer at the Lincoln National Guard Marathon and Half Marathon in May. Volunteers can help at the finish line, starting line, during the course and at events before and after the race.